This board Integrates a half duplex circuit inside. That means the transmit wire from your UART is connected to all of the AX-12 servos. 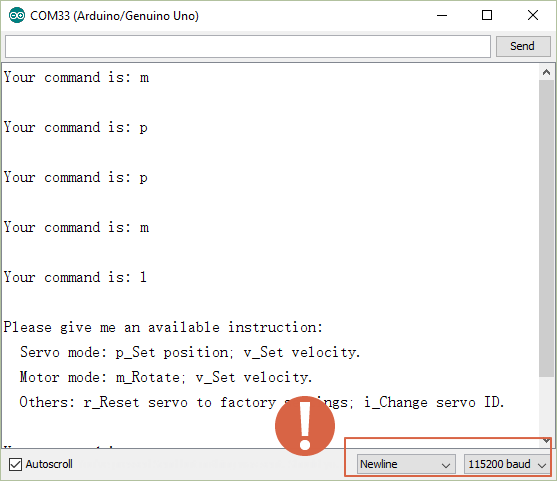 Hence: when you send a command over the wire then all of the servos will hear it - but because the message contains the destination servo ID then only one servo, matching that ID number, will process it. Because of the servo can be linked by serial bus, which can connect up to 200 servos. Each unit can feedback its position, rotation velocity, torque, current, motor temperature and so on.It can do rotating all round, and the velocity can be controlled, just act as a gear motor. This feature enables it to work as a motor of wheeled robots, or tracked robots. 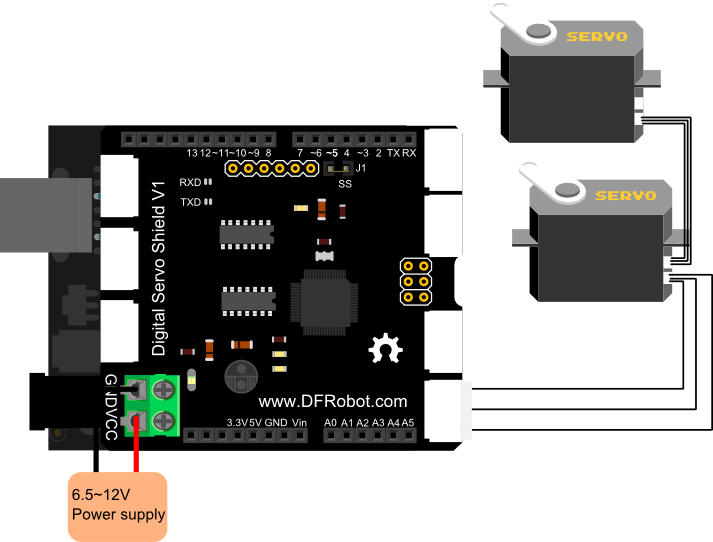 POWER SUPPLY: 6.5~12V power supply for servos & the whole system. UART SELECT: UART is already shorted by solder. When you use the UART FOR ATmega8 please remove solder off. Visit Forum for more details. 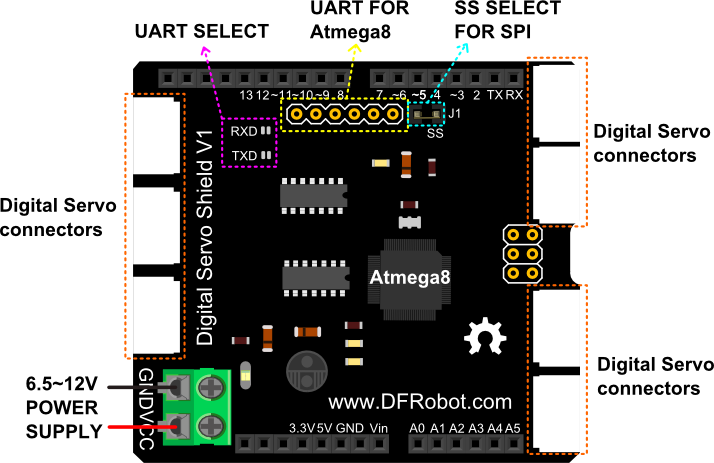 UART FOR ATmega8: This UART interface is for deeper development of the shield.You can program the atmega8 on the board with FTDI.Board choose "Arduino Optiboot8 "
SS SELECT FOR SPI: Digital pin 10 in default.If you want to use other digital pins,please remove the jumper cap and connect the ss header to other Arduino digital pin. # This Sample code is to test the Digital Servo Shield. case 'd':  //Reset servo to ID>>servoNum. If you don't know your Servo ID, please send "d". 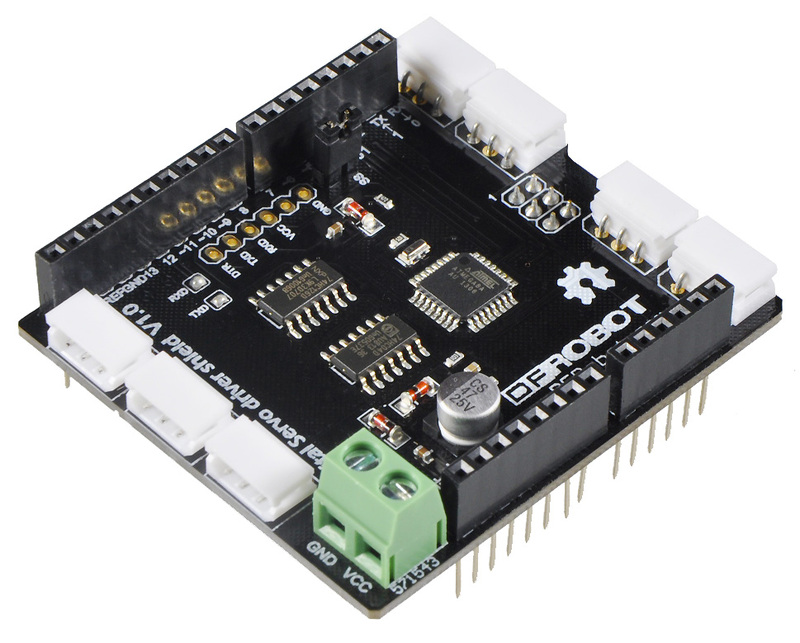 Get Smart Arduino Digital Servo Shield for Dynamixel AX from DFRobot Store or DFRobot Distributor.